Drought tolerant, pest resistant, and wildlife friendly, cutleaf staghorn sumac (Rhustyphina 'Laciniata') deserves to be more popular. This native plant can grow as either a large shrub or small tree, and it has long, fernlike leaves that turn a variety of gorgeous colors in autumn. The real challenge of this plant is its size and growth habit. Rhus typhina can grow over 20 feet high but is more a gigantic shrub than a tree. It spreads laterally by vigorous suckering, forming dense multi-stemmed thickets. It is an impressive plant to build a garden around, but never try to garden under it. The cultivar 'Laciniata' is an unusual cutleaf form of Rhus typhina, the staghorn sumac, which was selected from the wild population and propagated for garden use. 'Laciniata' resembles the wild form in all parts except its leaves which, like all leaves in this species, are pinnately compound—that is, leaflets are arranged in pairs along a central stalk. However, unlike ordinary Rhus typhina, 'Laciniata' leaflets are finely "cut," giving a textured, feathery look. The common name staghorn sumac refers to the antler-like curve of the stems as well as the reddish-brown velvety fuzz covering the younger (upper) stems. This pubescence is reminiscent of the velvet-covered new horns of the stag or male deer. The pubescent stems of Rhus typhina distinguish it from Rhus glabra, the smooth sumac, which is a dead ringer to the untrained eye, except for the lack of fuzz. The species Rhus typhina is widely distributed throughout the northeastern U.S. and southeastern Canada. It is found occasionally in wild places throughout the New York City area. Like other sumacs, it thrives in places where the soil is too thin or too dry for larger forest trees: natural openings in our native oak forests, wind-swept coastal shrublands and barren, rocky hilltops. It is also found in disturbed environments such as old fields, highway cuts, and along railroads. As you might already have guessed about a plant that enjoys growing next to the railroad tracks, staghorn sumac is not fussy. Used as a garden plant, staghorn sumac and its cutleaf variety thrive in full sun or light shade with little or no watering, once established. Pest problems are rare. It grows in the poorest soil, as long as its roots are not waterlogged, and appears to be tolerant of the reflected heat, dust, and smoke of city gardens. The cutleaf staghorn sumac, like the wild form, is variable in size, but has the potential to grow over 20 feet with an even greater spread. It gradually forms a large dense grove—an excellent shelter for wildlife. However, its size and spread can be controlled. One method involves pruning; cut some or all of the stems to ground level in early spring before growth begins. Regrowth is vigorous. Encircling plants with metal root barriers is an effective alternative to regular pruning. The enclosure not only fences in the sucker shoots but causes a "pot-bound" condition that dwarfs the entire plant—until it eventually goes into a noticeable decline or breaks free of the barrier, at which time it becomes necessary to tear the shrub out, repropagate from suckers and begin again. Seedlings of 'Laciniata' do not have the cut-leafed trait, and so it is necessary to propagate the cut-leaf form vegetatively. Grow new plants from root cuttings, or by digging up some of the abundantly produced "suckers" (new shoots emerging at ground level) complete with roots. The overall appearance and "feel" of this plant changes radically with the seasons. It is unusually fine-textured, even fernlike in leaf, but unusually coarse in winter, when the naked stems with their stout fuzzy twigs, topped with dried-out fruit clusters, look something like an assembly of giant hat racks in the landscape. Most people prefer this plant with its clothes on. The two-foot-long compound leaves are held up at an angle not quite horizontal but slightly upswept. This creates a pattern of slanted green lines, repeated at intervals because of the multistemmed habit, giving the plant a distinctive profile in leaf—a bit like a big rambling house with a complex gabled roof. Flower clusters appear in June. By midsummer they resemble 6-inch-long lopsided cones of tightly bunched velvety red buttons. Each cone-shaped inflorescence is positioned at a branch tip and is the culmination of the season's growth. Observed from a great enough distance, the flower clusters look like those of the plume-type cockscomb. By late summer the flower clusters ripen into bunches of fuzzy, cranberrylike fruits. Most will remain on the sumac well into winter. Although edible, they are very sour and apparently not the first choice of birds and foraging animals. Later in winter as the pickings get slimmer and the berries lose their tartness, they are eaten. Some wild-food connoisseurs and adventurous gardeners steep the fruits in hot water, making a sour lemonadelike concoction. By far the glory of sumacs is fall color, and the cutleaf staghorn sumac is one of the best of the bunch. Its autumn show starts earlier and lasts longer than most other kinds of trees; the leaves blaze intensely in fiery shades of orange, red, and gold. Cutleaf staghorn sumac has ornamental possibilities that go beyond heavy-duty applications like highway landscaping. For large suburban properties it makes a good buffer plant for peripheral areas, where it provides not only summer privacy but food and habitat for animals as well; it makes an excellent "transitional plant" between tamed and wild areas. 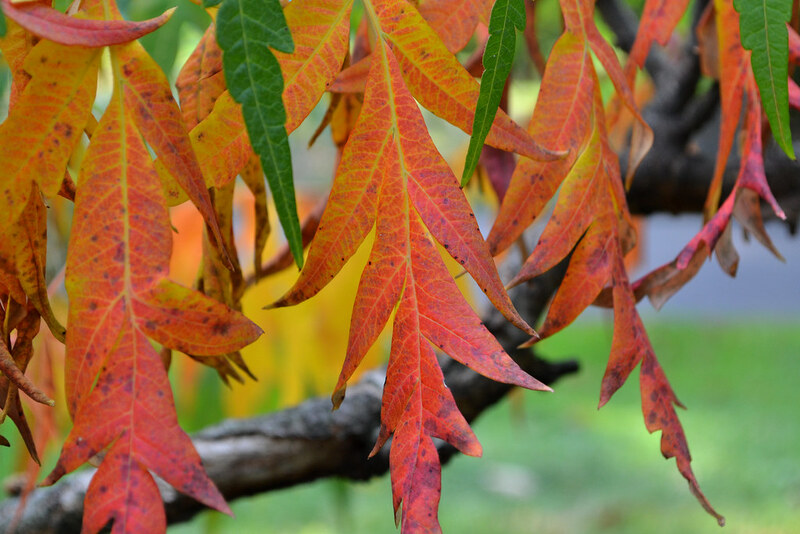 With its size controlled by pruning and/or root confinement, cutleaf staghorn sumac can be used in manicured gardens. It can serve as a bolder, textured alternative to the ubiquitous dogwood and Japanese maple when planted off the corner of a structure to anchor a foundation planting. For hot outdoor plazas, it is a rugged survivor and makes a strong "statement." For a mixed perennial border with a bold texture, try it as a specimen shrub to be cut back to the ground annually. Its wild appearance mixes especially well with grasses, and its spectacular fall color adds beautifully to any display of asters, chrysanthemums or goldenrod. Brooklyn Botanic Garden has two specimens of cutleaf staghorn sumac. Because the two sumacs grow in very different areas, they received very different treatment at planting time and look very different today. Our first specimen—on the Flatbush Avenue border mound, a wild, low-use, low-maintenance area—has been given little or no irrigation or fertilizer but allowed to run free. After 25 years it has formed an impressive erosion-stopping thicket, about 15 feet high and 25 feet across. Our second specimen—in the Cashew Family section of the Plant Family Collection on a sloping manicured lawn below the Tropical Pavilion—has grown for 9 years within the confines of a foot-deep aluminum root barrier. Despite annual fertilization and weekly watering, it has grown only as wide as the barrier has permitted and at 8 feet is barely taller than it was at planting time. Great article! Seeing as this was published in 1997, I was wondering how the metal-barrier enclosed sumac fared in your Cashew Family garden? Do you know if it ever escaped? I have a sumac tree in the corner of my front yard. It is getting very bushy. Can I cut some of the branches down from the bottom to make it look more like a tree? What time of the year should I do this? Hi Sally, staghorn sumac (Rhus typhina ‘Laciniata’) is notoriously vigorous, spreading by suckers and underground roots. As a result, many gardeners despise it! To maintain this plant, you will need to continuously snip or dig out the suckers as it spreads. As the article describes, you can also use an underground barrier to try to contain it. I have a large stag-horn sumac that just appeared in my yard 15-20 years ago. I read that if you prune it it will sucker. I don’t touch it. I have suckers everywhere. I pinch off all growth on suckers. So I have sumac “sticks” everywhere that require constant pinching. Anything I can do to get rid of them? I love my large sumac volunteer. I just have one cone on my bush. Wondering how to transplant a root—nothing seem to work. How do I plant Rhus typhina, staghorn sumac, in a pot—size, soil, care,etc.? I live in England, where Rhus tyhina is common and considered a pest because of its suckering habit. However, in the same way that a “root collar” will restrict suckering and size, the reduced opportunities for the plant (even in a large pot) comparable to a “collar” will reduce its speed of growth and ultimate size. So if you don’t want a huge plant and are happy to cut out suckers, it will do well. Keep the pot up on “feet” to ensure good drainage, and be sure to always have at least one baby sucker in another pot, growing on, in case of failure.The cut leaf, or dissecta, variety does not usually grow so big, so it is often grown in very shallow pots as a bonsai tree, which makes me think it should do very well in a standard container. Is it possible to grow a staghorn sumac in a pot? Rhus species generally are susceptible to many pests and diseases, but none seriously. The decline in your otherwise healthy plant may be the result of a combination of cultural conditions: for instance, a period of drought followed by stress of added salt to the soil (fertilizer is salty). The roots may be having difficulty taking up nutrients; the suckers may be getting nutrients from their own roots. Try spreading a thin layer of compost on the soil surface around the sumac to improve the soil structure and make nutrients available. Water during times of drought. We recommend consulting a certified arborist who can assess the sumac and provide care for it. Visit New York Arborists and click on the tab “Find an Arborist.” You can also send a sample of your sumac to the Cornell Plant Disease Diagnostic Clinic for analysis. We have a mature (10yrs/20ft) sumac in a small manicured city garden. In previous years it has always had an abundance of leaf and fruit growth by June, but this year the leaves are dwarf in size, the fruit is growing but the leaves seem to have stop progressing to full leaf. There is also far more sucker activity than in previous years. Once in a while I fertilize the sumac. Could this be over-fertilization? I also used a weed killer on nearby paving, but suckers are now growing from in between those pave stones, so I doubt it was that. We have a 30-foot spread of staghorn sumac, wour “natural fence.” A lot of it is 10 to 12 feet high, but we want it to be thicker and make a better blind. Is it best to prune it back in winter to the ground, or to 2 or 3 feet or so? We have a lot of little suckers in the patch, of variable size. We love it and want it to stay healthy, but we have never pruned it. What is best? I recently moved into a house with a 6-foot staghorn sumac. Its’ now spring and the tree looks healthy, but it has about 30 rust colored corncob-sized flowers from last year. Should I snip these off this spring to make room for new flowers? I have moved into a new house, and to the front of my garden they have planted a little staghorn. The lower branch has lovely colorful leaves on it, but the higher two don’t seem to be growing at all. Is this common and will they grow eventually? Sumac can usually tolerate severe pruning, so it very well may survive your nephew’s handiwork. The branches are naturally fuzzy, and if they start to develop new leaf buds, the plant should come back. Keep an eye out for new shoots coming up near the original plant’s base, which are also signs the sumac will recover. Make sure it has adequate water in the heat of the summer. My nephew cut my plant down. Now the branches are fuzzy and it looks like it might be dying, but the branches are not drying up. I was wondering if the plant might be in shock or is it dying? I purchased a Rhus typhina ‘Laciniata’ in summer 2012. The tag claimed it “turns a beautiful orange and scarlet red in fall,” but a year later it is a light green in November in Minneapolis, and I am a little disappointed. The only thing it does not get is full sun, but it does get 7 to 8 hours of full sun a day. What can I do? Hi, Jo: Trees sometimes drop fruit naturally in order to prepare for a better fruit crop later in the season, but early fruit drop can also be a response to disease, drought, or waterlogging due to poor drainage. However, without any other evidence of disease or pest symptoms, we can’t be sure why the fruit (called drupes) of your healthy sumac is dropping earlier in the season. Sumac drupes this time of year are unripe and quite sour, so birds and other animals normally wait until late fall or winter to feast. In our urban environment, there is also the possibility of humans stripping the fruit if it is within reach. My staghorn was looking really healthy and formed cones, which were light in color. This morning I noticed the little seeds on the cones are rapidly dropping off, leaving just the skeletal stem-like twigs that supported the seeds. Does anyone have any idea what is going wrong here? We have had a staghorn sumac in our backyard landscape for 12 years, beautiful and thriving here in Pennsylvania. LIke Patty said, this year the tree looks like it is dying. The leaves that have formed are all wilted, though there are plenty of healthy looking suckers all over the yard. I would really like to save it somehow as it is in a perfect spot and looks great covered in snow in the winter. If I cut it back to the ground, will it regrow? Rhus glabra, Rhus typhina, and Rhus aromatica (which has less showy seedpods than R. typhina and R. glabra. I bought a cutleaf sumac last summer. I ended up putting it into a large container last summer but moved it into the garden this spring, feeling very hopeful to see little leaf buds sprouting from the wood. The container seemed very moist when I removed, a detail that worried me a little. It is now in a sandy, well-drained area with 3 to 4 hours of full sun. Now, in early June, the buds, (still very alive) have not grown even the teeniest little bit. It’s like it has stopped growing as it looks the same as it did over a month ago. What should I do, and what is wrong with it? My large, treelike staghorn sumac has been beautiful for several years. I keep the suckers out as it is my focal specimen in the perennial rock garden. But so far it’s not leafing out at all and the number of suckers is more than in previous years. Do they just get to a point where they stop growing? We’re in SW Colorado…Zone 3/4 and we had a less-than-normal snowfall and no rain this spring. I hate to cut it down. Any hope just getting the suckers out? Any suggestions? I am looking for a sumac that can survive winter at Crowsnest Pass in the Canadian Rockies. I believe this is in Zone 3. I do want something that will give a good display of candles. Can you help me? We are not sure what is causing the problem with your staghorn sumac. Since the sumac, a root-prolific plant, is in a container, drainage may be an issue. If the soil has become soggy in the bottom of the container, the plant may have root rot to some degree, causing the dieback. You may wish to monitor the moisture level at the bottom of the container or repot to improve drainage. (On the other hand, drought is a common cause of plants losing leaves earlier in the season than usual.) Another set of symptoms to look for: drooping leaf stems, yellow patches on leaves changing to brown, and discoloring of interior stems. This suggests verticillium wilt, a common occurrence during cooler weather. It is not curable, but transplanting to a container with sterile soil may help. If the skin of the sumac has been damaged, you may notice a sticky substance on the stems. Wounds to the skin of the sumac often promote the suckers with which the plant in times of stress repropagates itself. You may wish to use a sucker to start a new plant. I have a golden cutleaf sumac. Its one of my favourites. My question is, when I planted it last summer (2011), it looked fine, but now I have two pretty large suckers on the ground. Can they take the life from the tree? The tree looks like it is dying, but the suckers are beautiful. I would appreciate any comments you might have. Thank you. I purchased a cutleaf staghorn sumac and loved it. It seemed to thrive at first, then when the summer got hot, the leaves started to shrivel and die. There are very few leaves left on the tree at this time. I have it in a large container. It’s about 2.5 feet tall at this time; branches and bark seem to be okay— just the leaves keep drying. I water it regularly and really don’t want to lose it. What can be the problem? Do I remove the old cones when I prune my sumac tree? Rhus typhina ‘Laciniata’ (cutleaf staghorn sumac), changing into fall colors along a Garden path. Photo by Lee Patrick.